What is the difference between the 605 GPS and the GPS In-car Holder accessory? Are the functionalities different? The 605 GPS includes maps for 22 countries of Europe as well as a TMC receiver that allows your GPS device to be informed of current traffic conditions. The In-car Holder accessory is only provided with the country’s map where you bought your accessory. For instance, if you bought your accessory in France, you will get access to one ‘region’ (1 big country and up to 2 small countries): France, Belgium and Luxembourg. The Accessory version of the GPS does not have the Traffic Messaging Channel functionality. Adding other maps: You can purchase other maps for the GPS In-Car Holder accessory by going into your ARCHOS account and clicking on GPS. Available maps will be listed there. Which version of the GPS accessory should I buy for my ARCHOS? If it is for an ARCHOS 605, it does not matter which one you have. You can purchase either the white box (Gen 5) or the black box (Internet Media Tablet). If you have an ARCHOS 5, you should buy the black box. The white box version (Gen 5) of the GPS accessory is also compatible with the ARCHOS 5 but the installation process is a bit more involved. Functionally, they are the same. To learn more, see the FAQ explaining how to install the white box version on an ARCHOS 5. I bought the GPS In-car Holder accessory but I cannot register it on my customer account. You cannot register the GPS In-car Holder accessory as it is not considered as a stand alone product. It is automatically registered during the installation process and activation of the maps. When you go into your customer account, you will see the available information regarding your GPS. Note: Make sure however that you previously registered your ARCHOS 5 or ARCHOS 605 on your customer account. Is the GPS In-car Holder accessory compatible with all ARCHOS products? No, this GPS accessory is only compatible with the ARCHOS 605 Portable Media Players and the ARCHOS 5 Internet Media Tablets. I have already installed the GPS on my ARCHOS. Can I install it on another ARCHOS device? No, you can only install it on one ARCHOS device. The license is then associated to that device and cannot be transferred to another device. I have entered a valid map code during the installation process with the DVD but it is refused. • Your map code might only be composed of 12 characters including an underlined digit/letter. In this case, instead of typing the underlined character, enter a “&” before the character that is underlined (ex: “2C4” becomes “2&C4”). • If your map code has 13 digits, reinstall your GPS software using the DVD. After inserting the installation DVD, the installer does not launch automatically. What should I do? Explore the DVD with Windows Explorer and click on GPS_Installer.exe. This will automatically launch the installer. Note: if there are no files on the DVD, please contact our Technical Support. Please contact our Technical Support by filling out the technical support web form found in ‘support’ inside of your ARCHOS account. This will happen if you are trying to install the GPS software onto a second ARCHOS device. The map code is only valid for one unique device. This could also happen when you try to reinstall the GPS software after your product has been repaired. In this case, fill out the technical support web form found in ‘support’ inside of your ARCHOS account. A support agent will explain what needs to be done. How can I install the Gen5 version (white box) of the GPS accessory on the ARCHOS 5? 1. Update the firmware of the ARCHOS 5 to the latest version (at minimum, it must have version 1.3.05). You can find this at www.archos.com/firmware. 2. Copy the DVD contents to a new folder on your computer (this could take a little while). 3. In this new folder, replace the file GPS_Installer.exe with the new version of this installer found at www.archos.com/gps_exe/GPS_Installer.exe (1.4MB). Do not run this, but save it to the new folder. 4. Connect the ARCHOS 5 to your computer and launch this new GPS_Installer.exe file and follow the instructions. First: Update the firmware of the ARCHOS 5 to the latest version (at minimum, it must have version 1.3.05). You can find this at www.archos.com/firmware . Skip this. Jump to step 2. On the ARCHOS 5, create a folder named gps and, inside this folder, create a subfolder named maps. Enter your map code and map version on the web page as requested. Then, click on Next. Copy the shown map folders into /gps/maps on the ARCHOS from the DVD. Copying map folders other than what is listed will not make those maps available on your ARCHOS. Copy the sdata folder from the DVD to the gps folder in the Archos. Copy the downloaded file lic_gps_plugin.aos to the ARCHOS 5 (not in any folder, just at the top level of the ARCHOS 5). Unplug the ARCHOS from the computer and install the updates when asked. I bought the ARCHOS 605 GPS (as the bundle : The 605 and the GPS Accessory together). Do I have to use the installation DVD supplied with the device? No, you do not need to use the DVD as the GPS software and maps have already been installed and activated on the 605 GPS. However, you may have to use it later to reinstall the GPS software if you have any problems with your GPS or have to format the disk of your ARCHOS. Where can I download POI (Points of Interest) such as radars on your Web site? First, make sure you registered your ARCHOS device (at http://www.archos.com/register). If it is not registered, you won’t be able to download the POIs. If your product is already registered, go into your customer account and click on "Manage Products". You can now download the POI file and save it on your device. This will automatically install the POIs. When I turn on my GPS, I am asked to "Check hardware settings". What should I do? 1) Your Car Power adapter is correctly connected to the power jack of the In-car holder and not the audio jack. 2) Your GPS connection cable is securely plugged to the ARCHOS device. 3) You have a valid GPS signal. A minimum of 3 green satellite squares are required for the ARCHOS to be able to locate your position. If the signal is poor, this means that you are in a poor reception area. Try driving a short distance or wait a few minutes for the GPS to lock in more satellites. Can I use the GPS and listen to music at the same time? Yes. If you have the latest firmware loaded onto your ARCHOS 5, start the music first and then start the GPS. With the ARCHOS 605 it is not possible to listen to music while the GPS program is running. ATTENTION: For your own security, do not try to operate the device when driving. Can I import other points of interests (such as radars) other than those available by ARCHOS? No, ARCHOS players are not compatible with 3rd party POI’s. However you can find additional POI’s in your customer account on the ARCHOS web site. Make sure though that you have already registered your ARCHOS device at http://www.archos.com/register . I have correctly set up the GPS in my vehicle but I have no valid GPS signal. 1. Wait a few minutes so that your GPS can find your current position. • Using your GPS for the first time. • You haven’t used your GPS for a long time. • Your GPS has been relocated without being used (e.g. after travelling by plane or train). 2. Make sure that your included cigarette-lighter power cable is always connected to the GPS. 3. Reset the ARCHOS. Press the power button for 15 seconds and then turn it back on as usual. 4. Make sure you have the latest GPS firmware on your ARCHOS. To update your firmware, go onto your customer account and then into the GPS section. 5. If your GPS takes more than 5 minutes to find a position, you may be in a poor reception area. Make sure that you are in an open area (no high buildings, dense trees or mountains around you) so that your device can get a clear reception. 6. Some cars have thermal protective windshields which can make reception difficult. Check your car manual to see if you have such a windshield and if there are zones specifically created that do not have this thermal protection, and would allow reception. Note: your GPS receiver is not affected by weather conditions. I have downloaded the radar file but the GPS won’t recognize it. Why? You may have not correctly copied the file to the ARCHOS. If it has been copied into any of the folders included in your ARCHOS, it won’t be executed automatically. You have to copy the file to the root* (top level) directory of your ARCHOS. Once the USB cable is removed from the device, it will be recognized and then you will see a quick progression bar indicating that it is installing into your device. *Note: the root directory is the one where you can see all of the other folders in the device. It is what you see when you first open the Archos from Windows Explorer. I have installed speed camera (radar) POI’s into my ARCHOS 605 but my GPS does not warn me when I get close to them. After installing your speed camera POIs, you also need to tell your GPS that you want to be warned upon approaching these POIs within a certain distance. 1. Click anywhere on the main map to get to the main menu. 2. Then go to the second screen of the main menu by clicking on the right arrow. 3. Click on "Manage POI". 4. From the “Manage POI” menu, click on "Warn when near POI". 5. Click on the bottom arrow on the right to scroll down the POI’s list until you find the POI for the speed cameras. This POI is called “rf”, which stands for radars that are in a fixed position. Click on "rf". 6. Choose from what distance you want to be warned when you get close to a speed camera and click on "Done". 7. Select a type of audio signal which will be your warning sound and click on "Done". Now whenever you come up to certain distance of a speed camera, your GPS will give you a visual warning as well as an audio warning. Can I add additional maps for my GPS and how? Yes, it is possible to add maps. The maps will be available for download from your customer account. Make sure however that you previously registered your ARCHOS in your customer account. I have installed the radar icons but they do not show up on my map. What do I do? After installing your speed camera POIs, you also need to tell your GPS that you want these POIs displayed on the map. 1. Go to the second screen of the main menu. 2. Click on "Manage POI". 3. Then click on "Hide/Show POI". 4. Scroll down until you see the icon "rf". This is the icon for Radars in a fixed position. Tap on the icon and a checkmark will appear. This means now that radars will appear on your maps. Note: Make sure that you select the Warn when near POI option in order to receive an audio warning when you are approaching one. I have correctly installed the TMC antenna but I cannot capture any signal (the TMC indicator is red). 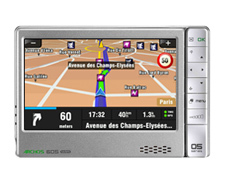 The ARCHOS 605 GPS (GPS and ARCHOS 605 purchased as one single box) is equipped with basic TMC reception that allows you to get information about current traffic conditions from free services. TMC is not broadcast to all roads. The coverage of which roads and highways varies by country and region. Free TMC services are available in Austria, Belgium, Denmark, France, Germany, Italy, Netherlands, Norway, Spain and Sweden. After updating my maps, the GPS asks to me to choose between "Europe" (or a European country) or "Maps". What should I select? Always select "Maps", which is the default selection. This folder contains all the maps that you bought. You can delete unnecessary files so that your GPS won’t ask you to choose between two options. 1. Connect your ARCHOS to your computer in Hard Drive mode (MENU > Settings > System > USB preference and select PC Hard Drive). 2. From the Windows Explorer, go into the “GPS” folder and then enter the “maps” folder. 3. Do not touch the “maps.mlm” file but do delete any other “.mlm” file. ATTENTION: Do not delete other files or folders as this would prevent the GPS from working. In your “maps” folder, you should only have the country folders, the “licence.txt” and “maps.mlm” files. The traffic information function (TMC) does not work. If you purchased the GPS as an accessory (not the bundled version 605 + GPS), there is no TMC receiver inside of the device. This is not a feature that can be activated in the accessory version. For the bundled version, check the manual to see how to correctly install the included TMC antenna. When I start the GPS, a message says that there are no available maps or that there is no valid activation code. An error may have occurred during the installation process or some files on your ARCHOS may have been damaged. 1. Connect your ARCHOS to your computer in Hard Drive mode (Menu > Settings > System [“Storage” for the ARCHOS 5]) and “PC Hard Drive” mode for the USB Preference. 2. Using your computer’s file explorer, delete the folder GPS on the ARCHOS. 3. Put the GPS DVD into your computer and do a fresh installation. 4. After the installation is finished, you can set your device back to ‘Windows Media Device’ for the USB preference if desired. Can I compute a route before installing the GPS in my car? Yes, you can compute a route before you plug your ARCHOS to the GPS In-car Holder.